New Delhi: After the massive protests across the state, the Jallikattu Bill was unanimously passed in Tamil Nadu Assembly on Monday evening. Tamil Nadu Chief Minister O Panneerselvam tabled the Jallikattu Bill after a special assembly session was held to pass the bill. The bill replaced the ordinance that was promulgated on Saturday amending the Prevention of Cruelty to Animals Act. The ordinance had the sanction of President Pranab Mukherjee. Earlier in the day, Tamil Nadu Governor CH Vidyasagar Rao said a bill to replace the ordinance issued to enable holding of Jallikattu will be placed in the assembly immediately. This happened on a day when the dragging protest at the Marina, the country’s longest beach, turned violent after police began their crackdown following the people’s refusal to disperse. Thousands of police personnel were deployed across Chennai, a majority invading the beach and dragging away young men who had been camping there demanding legalization of Jallikattu. There was bedlam as others tried to pull back those being taken away. Hundreds of youths, both male and female, formed a chain. Many ran towards the sea to dig in. There was a lot of slogan shouting too. Many of the protesters, after being ousted from the beach, took over neighbouring streets and hurled bricks and stones at the police. A large group torched several vehicles parked at the Ice House police station, sending thick clouds of black smoke rising in the sky. As fire tenders battled the flames, police used tear gas and batons to battle the mobs. This only triggered more violence. The trouble was intense in Triplicane area near the beach. All routes leading to the Marina were quickly cordoned off, leading to massive traffic jams in parts of Chennai. Amid vocal criticism from opposition parties and film personalities, including noted actor Kamal Haasan, that police should not have forcibly broken a peaceful protest, many protesters crawled back to the beach. Spiritual guru Sri Sri Ravi Shankar, himself a Tamil, appealed for calm and urged Tamils not to be swayed by anti-social elements. 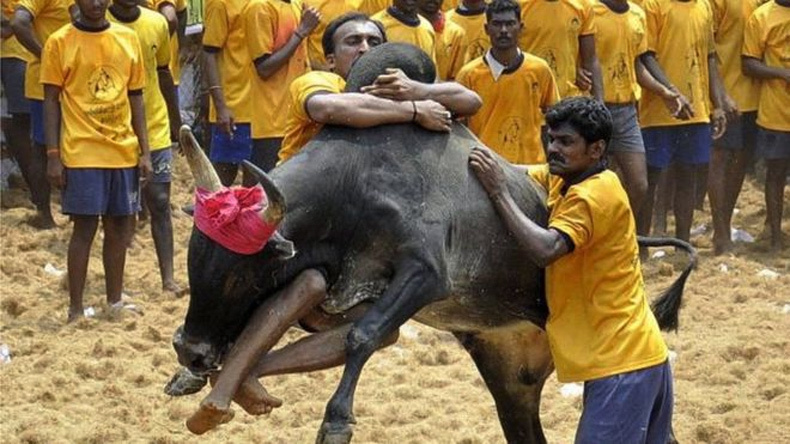 Jallikattu is the bull taming sport of Tamil Nadu played on its soil for several centuries. The Supreme Court had banned the sport resulting in a massive protest by students and the youth in the state starting on January 16. “Jallikattu is an integral part of the ancient tradition of Tamil Nadu and is inextricably linked to rural and agrarian customs and has religious significance for the people of Tamil Nadu. Jallikattu also addresses the cause of conservation of native breeds,” Rao said.